The number of farmers has increased in storing grain like the brown rice recently the use of the refrigerator for grain though there were a lot of farmers who use a strong for a long time storehouse. Moreover, the hole up which it digs under the soil has been used for a long time for storing the potato. Because the temperature in the underground of several meter-about ten meters becomes it at a temperature that is almost the same as the temperature of the well water, near the normal temperature during year, it is sure to become 17-18 degree C all the year round around here. I made the root cellar by thinking the underground was used in that when it was thought that it was possible to make it well without using electricity at all, and built the warehouse for agriculture. 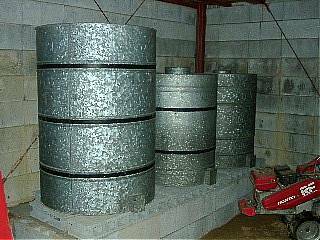 This is a cross section of the light iron frame warehouse for the agriculture used by my home. The attic was used like the second floor making the floor on the way though the size of the warehouse was an one-storied house of the width about 8m about 6m in depth. Two (the north side and the west side of the warehouse) has been buried under the soil by about the maximum 2m. The wall in the part that had been buried under the soil built the grain silo made of the concrete block on the corner of the northwest of the warehouse. The storing can of rice is put here and the brown rice is stored. 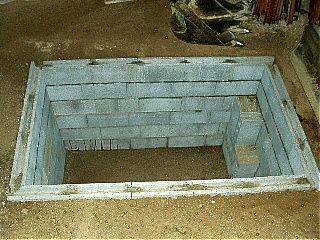 Moreover, it dug up the pit of about 120cm in depth in the below the floor level of the warehouse, it enclosed with the concrete block, and it made it to pit type storehouses of the potatoes. Water doesn't come out from this place originally in the place in the mountain that is the ridge even if a little digging up the underground because moisture is a little. This is a photograph in the grain silo of the half underground type. This part is scheduled to be partitioned with the concrete block in the future though it is still producing. In a large can, cans that are for 600kg smaller are for 300kg. The can is raised like taking out rice easily and about 50cm umbrella is raised from the floor. The part on the floor has covered with concrete now. Moisture disappeared almost because the outside in the building also covered with concrete though it rained. This warehouse is a half originally underground, and the potato never never rots in this depth at the midwinter because it digs in the building. The sweet potato can be stored quite without trouble next spring. I do not think that I become 10℃ or less maybe at the midwinter. Skin of paddy is put in surroundings of the sweet potato and insulation is improved further. Moreover, because the lid on this is made from a wooden 2x4 material of about 4cm in thickness, it is very strong. It is impossible at all if in digging up such a hole, the construction of the warehouse, and the movement of the soil, there are no power shovels (backhoe). This soil calls, alias "[Namera]" and is very hard. It is a hard soil that weathers granite and can be done. This is a photograph of the root cellar of the tunnel type under production. I make this little by little spending years how many. It doesn't yet complete it. There are width about 230cm and about 190cm in the depth about 180cm in height. There is a concrete pillar for reinforcement in the center. The wall built the ceiling with ferroconcrete made of the concrete block. 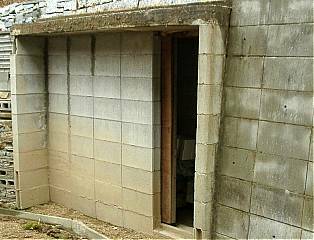 It is scheduled that the wall of the concrete block is made further this inside, and reinforcement and the moisture of the wall are prevented in the future because this place is a little wet. The umbrella schedules to raise it more on the floor. When completion is that comes?